I used to think that the low-fat vegan crowd were diet-Nazis, who couldn’t even begrudge me a reasonable amount of fat or meat in my diet. They seemed particularly humourless, singularly bent on taking all the fun out of food. Well, I finally “get it” now, and not because of their constant beratings and lectures. I started eating a very low fat (~10% of calories) diet, because I learned a few simple things. First, the body doesn’t easily turn carbohydrates into fat (de novo lipogenesis in humans is slow and basically insignificant). Secondly, the body simply and reliably burns fat from adipose tissue during low to moderate exercise . So, I put 2+2 together, and eat only “carbs” (breads, tortillas, noodles, etc.) and avoid all fats (oils, meats, etc.). I eat whenever I’m hungry, and my exercise is a one-way fat burn (can’t come back, even if I eat a loaf of bread after a workout). 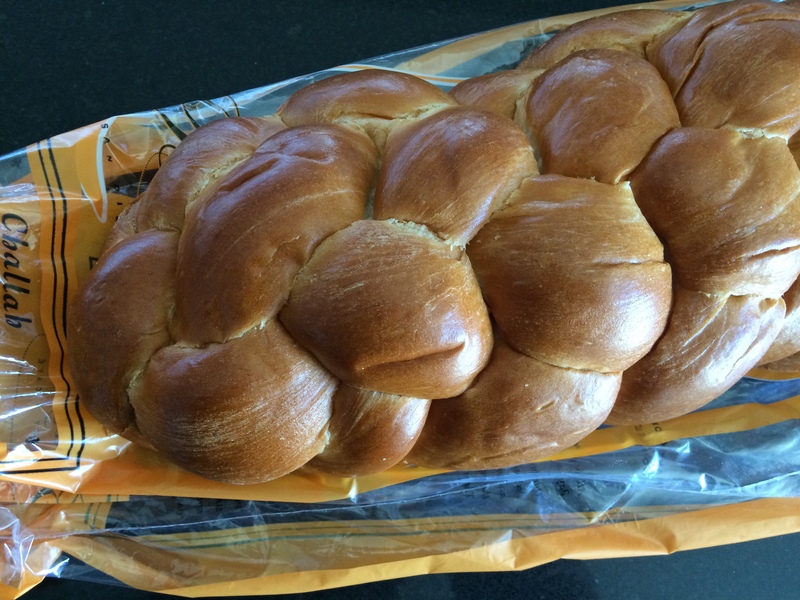 I ate most of this challah loaf after a 100km ride on Saturday. It’s made with eggs, so it has more fat than I wanted, but 50g of fat after a hard workout won’t kill you. Before the ride, I ate a nice fresh bagel and drank 350ml of orange juice. For dinner, I had a rice and bean burrito. For dessert I ate about 300g (most of the box) of Shredded Wheat cereal with blueberries, bananas, and almond milk. I ate a few corn tortillas for good measure. So, I’ll continue with this low-fat diet (<10% of calories) and we’ll compare the weightloss rate on my progress chart. I’m never hungry, and even occasionally overeat a little too much bread and/or tortillas. But I’m progressing towards my 70 – 75 kg goal (I weighed in at 77.4 kg this morning) at a noticeable pace. It’s pretty rewarding, and worth giving up the fat for. Don’t worry, I’ll eat reasonable amounts of meat after I make my weight goal.